Installation kit for Honeywell- Bendix/King KX155A, KX165A, with or without Glideslope . This is a complete, unused installation kit, Honeywell p/n 050-03378-0000, does NOT include the connector mounting plate. The kit includes connectors, contacts, and hardware (screws, clamps, etc). 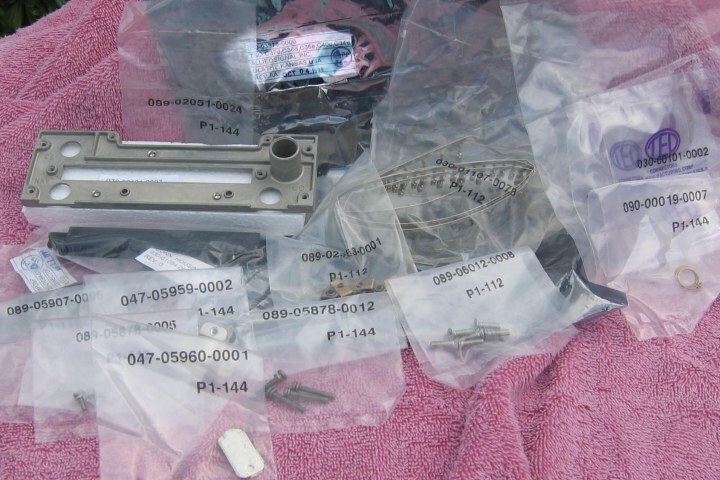 A complete list by part number is shown below- polarizing keys come pre-installed in the connectors. The contents of this kit cover all versions of KX-155A. For installations without GS, some parts will be left over. For a limited time, I am offering FREE use of the INSTALLATION manual for this item ($25 deposit required). Please be sure to specify whether you are installing a KX155, or a KX155A. In order to take advantage of this limited time offer- please make a separate refundable PayPAL payment of $25 to my Paypal ID. This is your deposit for the manual. You will have 10 days to from the day I ship, to get it back to me. As long as I receive the original manual back- in the same condition as when it was shipped- by midnight of the 10th day, I will refund your $25 deposit. If the manual does not arrive back by the 10th day, you will not receive your refund! No exceptions. If you pay by check, include the extra $25 deposit with your payment, and a note indicating you want to borrow the installation manual. Return shipping of the manual should be by USPS priority mail, with tracking for your proof of receipt on my end.